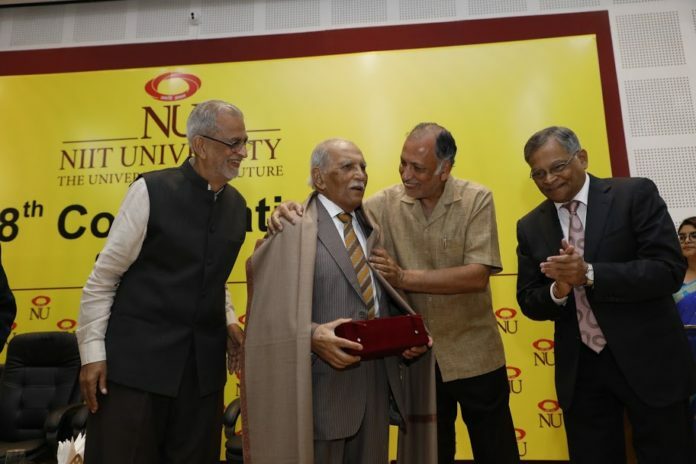 Neemrana: Established with a vision to bring about innovation in higher education and learning in emerging areas of the knowledge society, the not-for-profit NIIT University (NU) awarded Shri F. C. Kohli its first honorary doctorate during the 8th Convocation Ceremony. Shri F. C. Kohli is the father of Indian software industry and the founder and first CEO of Tata Consultancy Services. Dr. K Kasturirangan, Former Chairman, Indian Space Research Organisation was the Chief Guest on the occasion. Mr. Rajendra S Pawar, Founder, NU and Chairman, NIIT Ltd.; Mr. Vijay Thadani, Co-founder, NU and Vice Chairman and MD, NIIT Ltd., Prof. VS Rao, President, NIIT University and Debjani Ghosh, President, Nasscom were also present on the occasion. At the 8th convocation ceremony, more than 500 NU students were awarded degree certificates for successful completion of various programmes, including B. Tech, M. Tech (Business Analytics) MBA, PG Diploma (Banking & Finance) amongst others. F. C. Kohli is an Indian industrialist. He is frequently referred to as the ‘Father of the Indian Software Industry’. He has been conferred with various distinguished awards and honours. In 2002, Mr. Kohli was awarded the Padma Bhushan for his contribution to the Indian Software Industry. Congratulating the students on their success Dr. K Kasturirangan, Former Chairman, Indian Space Research Organisation said, “I find that the academic programs of NU are very thoughtfully strategized in terms of its industrial linkage, being technology driven with appropriate focus on research coupled with seamlessness. I have no doubt that NU is moving in the direction of becoming a world class Centre of learning and erudition”. Shri F. C. Kohli, Founder, Tata Consultancy Services gave his heartiest congratulations to all the students and wished them success in the years to come. 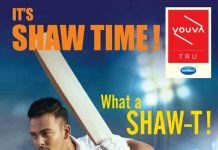 “Established in 2009, NU has perfected and internalised the tradition of 100% placement, 5th year running”, added Mr. Pawar.